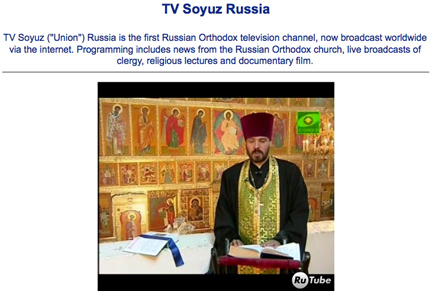 [SatBroadcasting(tm)] The orthodox Soyuz TV channel has started broadcasting in Europe, Middle East, North Africa, and North America. The Yekaterinburg Diocese information agency that owns the TV channel reported that the broadcasting is launched on two new satellites — HotBird 6 and Galaxy 19. According to head of the diocesan information and publishing department, Hegumen Dimitry (Baybakov), last year the TV channel received Patriarch Kirill's blessing to work on launching full-fledged international broadcasting. Fr. Dimitry further stated the project is unique as the only Orthodox channel being broadcast to more than 500 open channels in more than 40 world languages via HotBird 6. The TV channel plans to further develop satellite broadcasting in South America, Australia and Asia in coming years. To view the channel online, select this direct link.